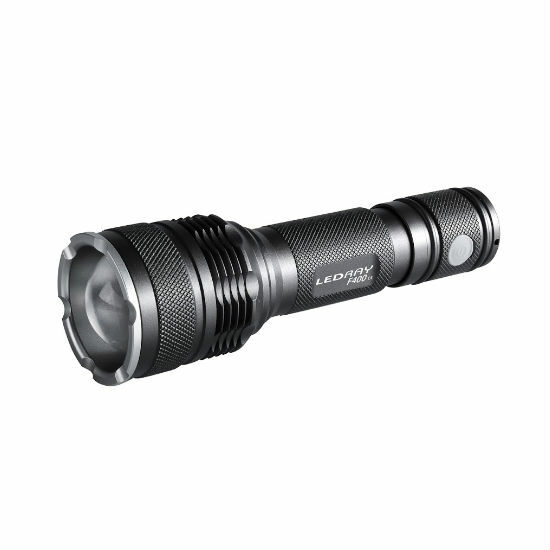 The LedRay F400 torch offers an easily focusable beam with adjustable brightness. It utilises the latest LED technology and internal electronics to provide a constant current output which extends battery life and maintains brightness. Powered by 2x CR123A or Tracer CR 123A 3.7V rechargeable batteries. There are 3 levels of brightness capable of reaching up to 300m. Change between brightness output and access the strobe mode by pressing the secondary button. Focus the beam from spot to flood by simply twisting the lamp head. Ready for gun mounting this kit has all you need including quick release clamps for 1'' and 30mm scopes, a remote pressure switch and a 2" threaded 'Snoot' shade to reduce barrel and sound moderator glare. Lamp filters are available but sold separately. This lamp has a durable and robust design with an anti-shatter lens and it's water resistant. Supplied in a hard ABS carry case with batteries. Tracer Rechargeable CR123A 3.7V regulated lithium batteries and charger are also available separately.